We are based in Los Angeles, California. NE People Shop is an online store that aims to stay on top of the latest trends in women's and men's clothing. Our goal is to provide fashionable, comfortable and high quality clothes at affordable price. For customer service inquiries or to initiate a return, please contact NE People at 213-281-8884 or nepeopleshop@gmail.com. You can initiate a return for new and unopened items within 30 days of delivery for a refund. To qualify for a refund, items must be in new and unused condition with all original materials and/or accessories. If a return is not received at our processing facility within 45 days, it may be subject to a partial refund. If the return is a result of a fulfillment error, product defect, or damage incurred during shipping, we will refund the full cost of the merchandise. Due to our 100% satisfaction guarantee we provide a free pre-paid return shipping label for Non-Buyer's Remorse and Buyer's Remorse returns. SPECIAL RETURNS INSTRUCTIONS: Once the seller approves the returns request, they will provide a Returns Merchandise Authorization. This jacket is a thin thermal hoodie. Its the kind of jacket that can be worn on a daily basis. It is very casual and simple. It can be styled with any tshirt or tanktop! Since the fabric isn't too thick, it can be worn casually for any weather. There is a zipper that allows the jacket to be styled in your own way. You can zip it all the way, half way, or just leave the jacket open. 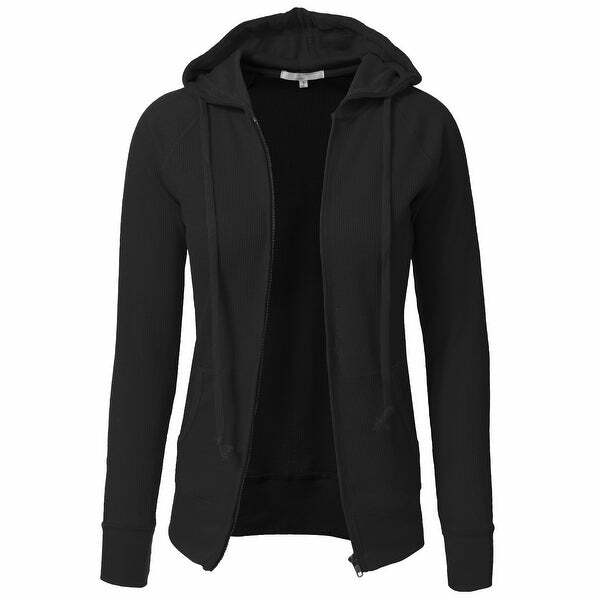 This hoodie can also be worn when you're going for a simple jog or hike as well! Small - Chest: 34in. / Botton Width: 27in. / Sleeve Length: 26.5in. Medium - Chest: 35in. / Botton Width: 28in. / Sleeve Length: 27in. Large - Chest: 36in. / Botton Width: 29in. / Sleeve Length: 27.5in. The fit is a little funny -- tighter than it should be in the arms. Would have to be worn with a tank and not over a short or long sleeved tee. The color is darker than pictured (not a light grey). I'm keeping it because I like the waffle/thermal fabric. this picture looks like a jacket. I received something looking like a thermal shirt hoodie. this item is for spring weather or must be layered with other clothing. This jacket was alright. It fit well but I didn't like how it looked on me. At first, I was disappointed but after wearing it, I love it! Warm and lightweight at the same time. I can wear it with any outfit, very versatile. Very lightweight and perfect to wear when it's cool. The color is a darker red, not the bright red shown in the picture. It is comfortable, so I have been wearing it a lot. Great fit. I get alot of compliments when i wear this !